Holy Cross Energy's mapping application shows where lights were added in an area. Holy Cross Energy, an electric cooperative in western Colorado, used GIS technology to help update and correct its billing system for the cost of street and security lighting—a move that is saving the utility and some of its customers hundreds of dollars per month. A member-owned cooperative founded in 1939, Holy Cross Energy serves more than 55,000 meters in communities such as Vail, Aspen, and Beaver Creek. The utility's security and streetlight project involved digitally mapping security lights and streetlights within its service area using GPS, aerial photographs, and a custom web mapping application powered by Esri's ArcGIS technology. The project started in May 2010 after Holy Cross Energy staff determined that the utility's maps needed to be updated with the exact location of street and security lights. Staff started with various levels of information in its billing system and incorrect or missing map information. First, the utility sent crews into the field to collect the exact GPS location for each streetlight. In the past, the locations of street and security lights were created without GPS points. Some streetlight locations were created in previous CAD programs. 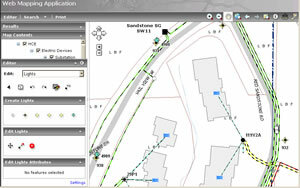 In other cases, the location of a streetlight was entered into the GIS based on proximity to the billing address on file. Some security lights in rural areas, such as county roads, were not shown at all. Meter supervisor Tonya Warmenhoven started the security and streetlight project by going into the field with a laptop that was loaded with software, including a custom map, from Esri and Esri partner Futura. During her on-site evaluation, she was able to find lights according to GPS location and mark the locations on paper maps. Later in the project, the utility's GIS team created a web application to make paper maps unnecessary. Some regions of the project area did not rely on GPS points because the aerial images provided enough detail. In those cases, Warmenhoven e-mailed the GIS analyst marked-up screen shots of areas. The GIS analyst, in turn, placed points into ArcGIS according to the sketch. 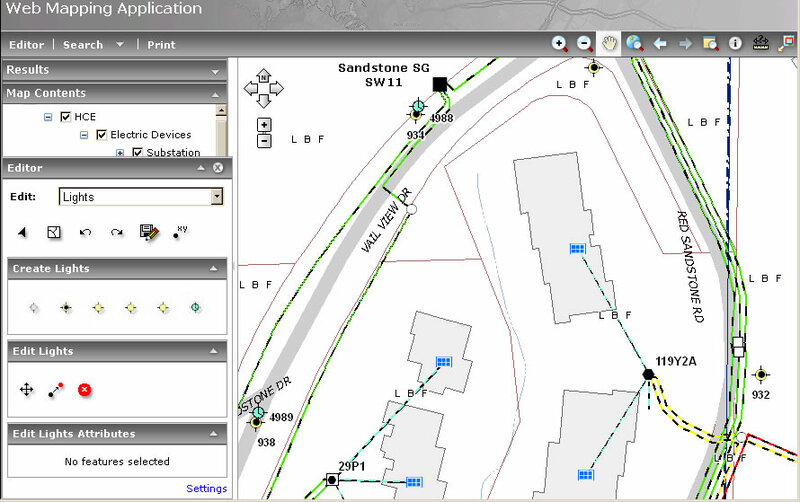 As the project progressed, Holy Cross graduated to using ArcGIS for Server with a custom web editing application. Warmenhoven could then enter all the data herself, eliminating the steps of marking paper maps and e-mailing updates to the GIS analyst. Using the web editing application, Warmenhoven could edit the light features only to ensure that she did not inadvertently update another feature. She was pleased to have complete control over editing the light features with a next-day turnaround of the data for everyone in the company. One of the utility's old paper maps shows the same area, with streetlights noticeably missing. Meter supervisors can now update the GIS and complete their work faster, as the updates do not have to be made by the GIS analyst. In an upgrade to the initial project process, Holy Cross has eliminated the process of marking up paper maps and sending them to the GIS analyst. All edits can be made through the web application hosted at the company's main office in Glenwood Springs. This only requires access to a web browser at the satellite office where Warmenhoven works. The new process saves Holy Cross four labor hours each week. The updated information has helped to improve accuracy in the utility's billing system by ensuring that all street and security lights are properly accounted for and billed. Throughout the utility's service area, towns and subdivisions have benefited from the cleanup of streetlight data and accounting. "We have saved $442 per month for one of the towns we serve, as they were paying for devices that no longer existed and were paying for higher wattage bulbs than they should have been, "Warmenhoven said. "An association in our service area, on the other hand, had been getting free power for its streetlights and lighted address markers for at least 10 years. They are now billed $600 per month for 178 new devices we have added." Holy Cross Energy has benefited by having correct information to provide to its consumers and its billing department. Service and billing personnel now have precise data about devices in the field. In the past, field crews would have had to call the billing department to get information about street and security lights. Now they have access to that data via laptops in the line trucks. For more information, contact Josh Snoddy at joshsnoddy@holycross.com.